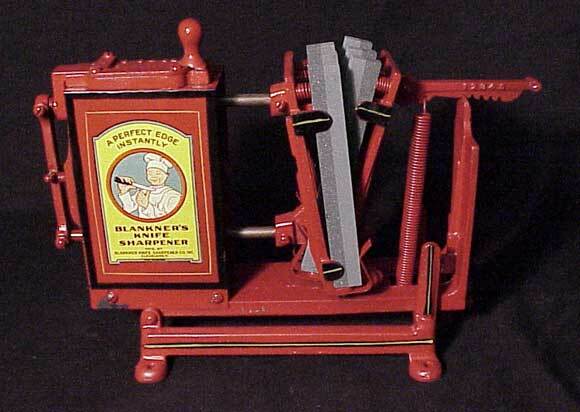 The Blankner Knife Sharpener Co. 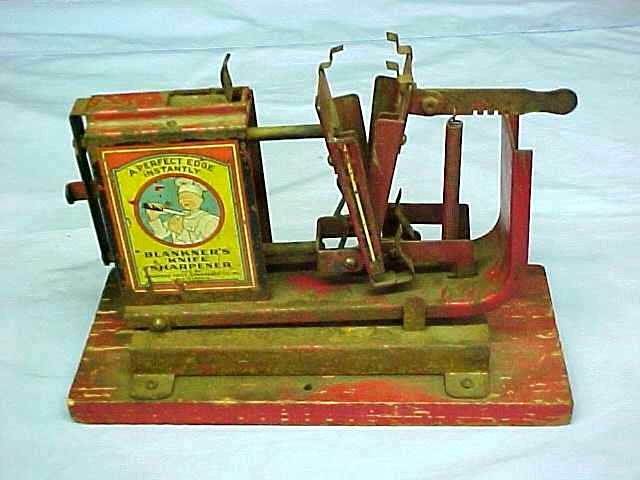 The company's name was apparently Blankner Manufacturing, Inc., but various material refers to Blankner Knife Company and Blankner Knife Sharpener Co. It was founded in 1928 to make knife sharpeners and closed in 1933. Address was 208 St. Clair Ave., NW, Cleveland, OH. President was William F. Blankner. His son Fred W. Blankner was V.P.-Treas. Fred later founded Blankner Millenry and made hats. William Blankner is also the inventor of the Blankner Sealing Machine - to seal line cracks in newly constructed highways. Mr. Blankner died 7-11-47 at age 83, while still actively employed in the patent department of Hecker Engineering Co. The early model - cast iron with 6 stones. This sharpener is in the Western Reserve Historical Society Museum, Cleveland, OH, donated by Steve Bottorff. The later model - metal stampings with 4 stones.